In the effort to thicken my skin, push myself out of my comfort zone, develop my skills and use some of the new Lawn Fawn stamps I received for the holidays, I am entering a Lawnscaping Challenge for the first time. That and I have been meaning to do it for ages now because it features adorable and clever projects. 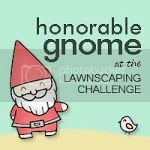 Lawnscaping Challenge No. 49 is all about celebrating Lawnscaping's birthday. My inspiration came from the movie "Up" which I happen to love. What is more fun than a house with a huge amount of pretty balloons allowing it to float in the sky? 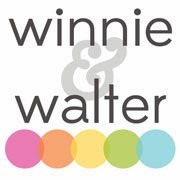 My color scheme came from a patterned paper from Studio Calico's (along with Tim and Beck aka Sassafras) Heyday 6x6 paper pad. I stamped the house in brown sugar by Jenni Bowlin for Ranger from Sweet Christmas and then colored in sections of the house using Distress Markers. For the background I stamped a piece of white cardstock with the clouds from Sunny Skies in speckled egg by Jenni Bowlin for Ranger. For a paler color on the background I stamped all the clouds after stamping off on a piece of scrap paper. The scallop border is a border from Belinda's Borders that I felt mimiced the scallop design found on the patterned paper of the house that I stamped in brown sugar by Jenni Bowlin for Ranger on a piece of Crush paper from Studio Calico's Heyday collection. I adhered it to the back of the cloud paper. The balloons from Admit One are colored in with Distress Markers and highlighted a bit with a white Signo Uniball pen. I like how the coloring looks streaky which somehow reminds me of a real balloon. 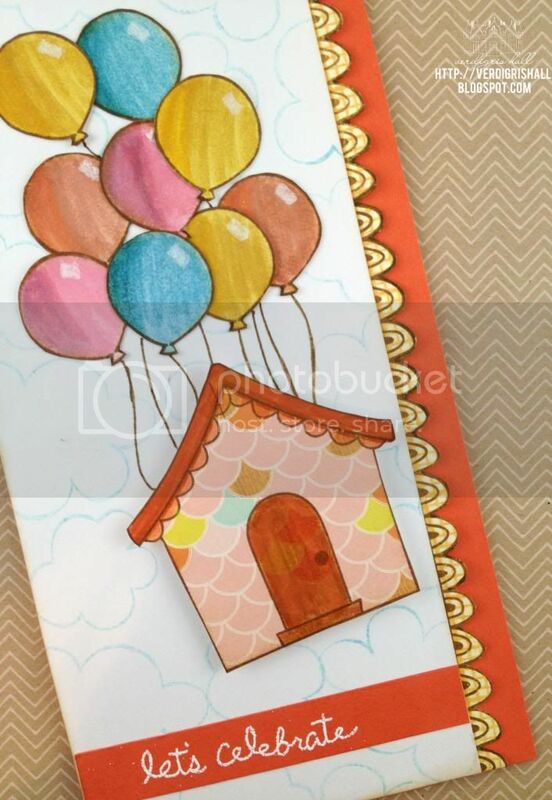 I attached the balloons to the card and drew in strings with my vintage photo Distress Marker. I adhered the house on with foam adhesive. The cloud panel was then adhered to a piece of orange cardstock (Stampin' Up! I believe). The sentiment is from Sophie's Sentiments that I embossed using Tsukineko's VersaMark ink and opaque white embossing powder by JudiKins. Here is a little more of a detailed shot of the card. I think it turned out pretty cute and could work as an invitation or a birthday card (or any sort of celebratory event in fact). Happy birthday, Lawnscaping and I hope you enjoy many more years of challenges to come! 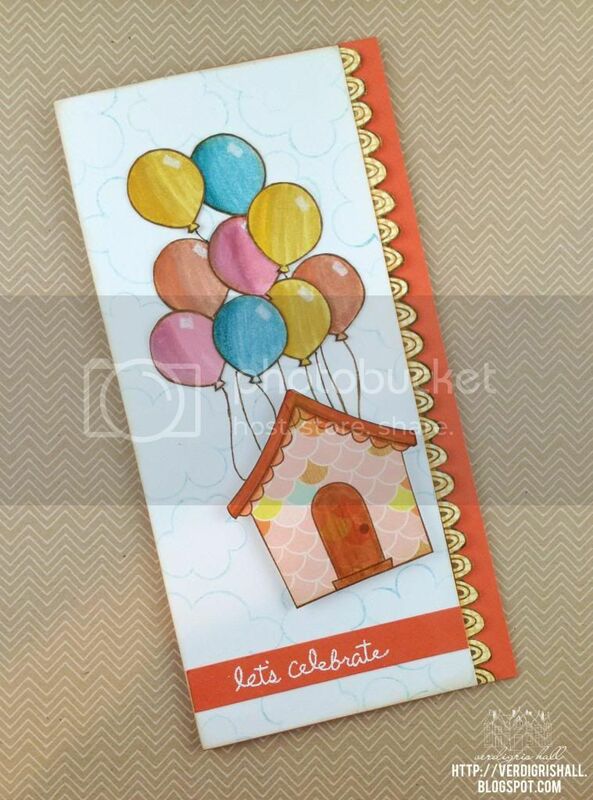 Cardstock: white, Georgia Pacific; orange, Stampin' Up! That's awesome Shay, challenges are really fun to play along with and your card is beautiful. I like the streaks in the balloons too. Have a BEAUTIFUL day!! LOVE. there's nothing else to say about this card. Maybe that I ADORE it. Thanks for playing along with us at lawnscaping! So adorable! I love the streakiness in the balloons. It gave them almost a woodgrain texture. 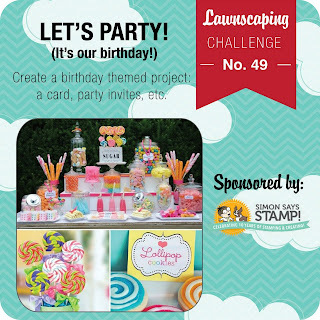 Thanks so much for playing with us at Lawnscaping for our birthday challenge! 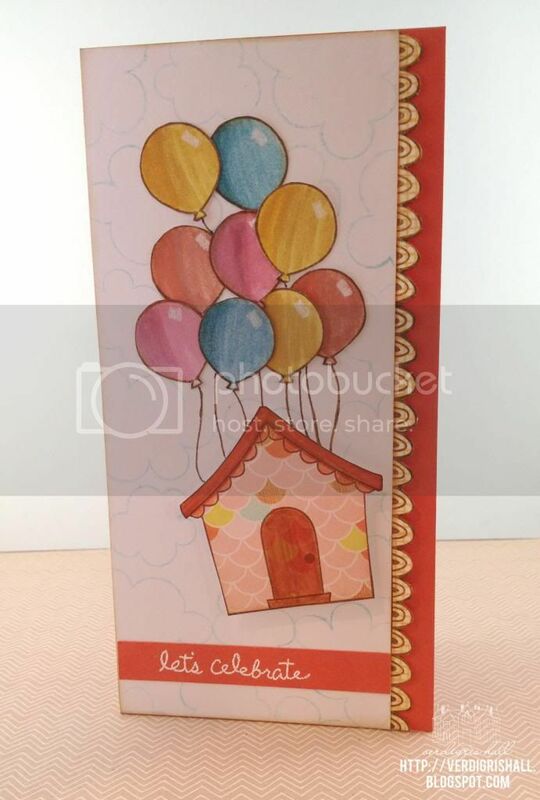 really fun TALL card - I love them and don't make them enough. cute cute cute!